Boxoft Screen Tutorial Creator is powerful but easy-to-use software to create live and clear tutorial from screenshot with ease. The friendly user interface guides you operation details in a clear way. You can make a complete tutorial just by capturing screen, inputting instructed text, and then publishing with wanted format (PDF, Word, Html). No more professional tutorial editing skills needed. The complete set of A-PDF Screen Tutorial Maker features include Simple, Fast, Effective: You will create visual documents in less time with less effort. A-PDF Screen Tutorial Maker will help you communicate more clearly, saving you time in all aspects of your business. Guaranteed. All the Power, None of the Hassle: A-PDF Screen Tutorial Maker is so simple to use you will be up and running in under 5 minutes. 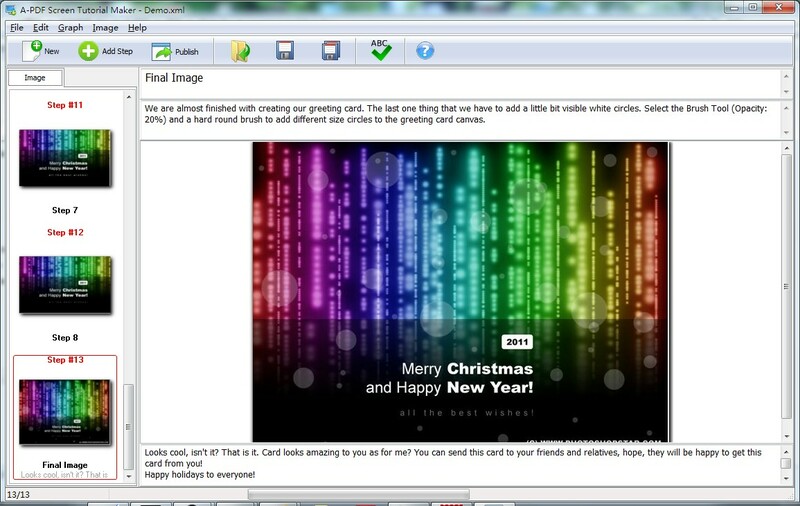 A-PDF Screen Tutorial Maker removes all of the hassle associated with working with screenshots inside of documents. A-PDF Screen Tutorial Maker makes what is a time consuming and tedious process fun. Powerful Export Options: A-PDF Screen Tutorial Maker makes sharing your content easy. Export formats include HTML, PDF, MS Word/Apple Pages, blogs, wikis and content management systems and emails.